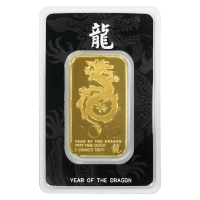 Buy 1 oz NTR Year of the Dragon Gold Wafer Bars | ?? Each gold bar is hermetically sealed in a tamper-proof display card. 1盎司NTR龙年金箔条 Each gold bar is hermetically sealed in a tamper-proof display card.